"Orange juice for breakfast is over," an investor interested in creating large, fair trade coconut plantations recently joked to me. These days, coconut water is king. For the trendy and the wealthy, including celebrities such as Rihanna, Madonna or Matthew McConaughey, rarest coconut water extracted from the aromatic varieties of the nut, is the "it" drink and even a source of income. Coconut water is being sold by luxury brands, at up to US$7 for 33 cl, about the same price as basic champagne. Even President Barack Obama loves coconuts. There is no doubt that the coconut market is exploding. Coconut water currently represents an annual turnover of US$2 billion. It is expected to reach US$4 billion in the next five years. In 2007, a 25% stake in Vitacoco, the largest brand for coconut water, was sold for US$7 million to Verlinvest company. Seven years later, another 25% stake in Vitacoco was again sold to Red Bull China for about US$166 million. Other large players in the coconut water business include Coca-Cola and PepsiCo, but more than 200 brands are now marketing coconut water. But there's another side to the story. The coconut is one of 35 food crops listed in Annex 1 of the International Treaty on Plant Genetic Resources for Food and Agriculture and considered crucial to global food security. In 2014, the Food and Agriculture Organization estimated global production to be 61.5 million tonnes. It is an important livelihood crop for more than 11 million farmers, most of whom are smallholders, cultivating coconut palms on around 12 million hectares of land in at least 94 countries worldwide. The coconut palm is popularly known as the "Tree of Life" - all its parts are useful. The main products are copra - the dried inner meat of the nut, used for oil - and the husk, which provides a vital source of fibre. More recently, as we've seen, there is also high demand for tender coconut water and virgin coconut oil. Braiding ropes made from the husk of the niu magi magi variety on Taveuni Island, Fiji, 2012. Whole mature nuts are exported and sold to factories that produce desiccated coconut and coconut cream. At least half of the coconuts are consumed locally. Over millennia, humans have slowly selected and maintained numerous coconut varieties, used for many purposes. Diversity of coconut fruits in ex situ genebanks. This has resulted in an extraordinary morphological diversity, which is expressed in the range of colours, shapes and sizes of the fruits. But the extent of this diversity is largely unknown at the global level. The huge amount of work that has gone into coconut breeding by farmers over millennia, and by scientists during the 20th century, remains greatly under-valued. The rarest coconut varieties, for instance the horned coconut, grown and conserved on the Tetiaroa Atoll and in India, are not even recognised as coconuts by most people, especially Westerners. The genetic diversity found in coconut populations and varieties, known by scientists as "germplasm", is conserved by millions of small farmers. A Samoan teen holds the famous niu afa coconut variety. The Polymotu concept capitalises on the geographical or reproductive isolation of various species for the conservation and reproduction of individual varieties of plants, trees and even animals. In a project led by the Pacific Community and funded by the Global Crop Diversity Trust, two small islands in Samoa have been recently replanted with the famous traditional niu afa variety, which produces the largest coconut fruits in the world, reaching more than 40 cm long. Sadly, the coconut is endangered. One of the main challenges of coconut cultivation is the existence of lethal diseases, which are rapidly expanding and killing millions of palms. These pandemics are known as lethal yellowing diseases. The diseases ravage countries in Africa (in Tanzania, Mozambique, Ghana, Nigeria, Cameroon, Côte d'Ivoire), and also in Asia (India), North America (Mexico, the Caribbean, Florida) and the Pacific Region (Papua New Guinea, and probably Solomon Islands). The genetic diversity of the flowers of coconut varieties on display at the Marc Delorme Research Centre, Côte d'Ivoire. Many coconut varieties that could be crucial for the future of agriculture are disappearing because of the loss of traditional knowledge, rapid transformations of agricultural landscapes, climate change and westernisation. Due to the fragility of insular ecosystems, the Pacific Region is probably the location where the losses are highest. During a recent survey in the Cook Islands, we succeeded with considerable difficulty in locating a sweet husk palm, known as niu mangaro locally. This is a rare, highly threatened form of coconut. The husk of its unripe fruit, which in other species is usually tough and astringent, is tender, edible and sweet. It can be chewed like sugarcane. Once the fruits are ripe, the husk fibres are white and thin. 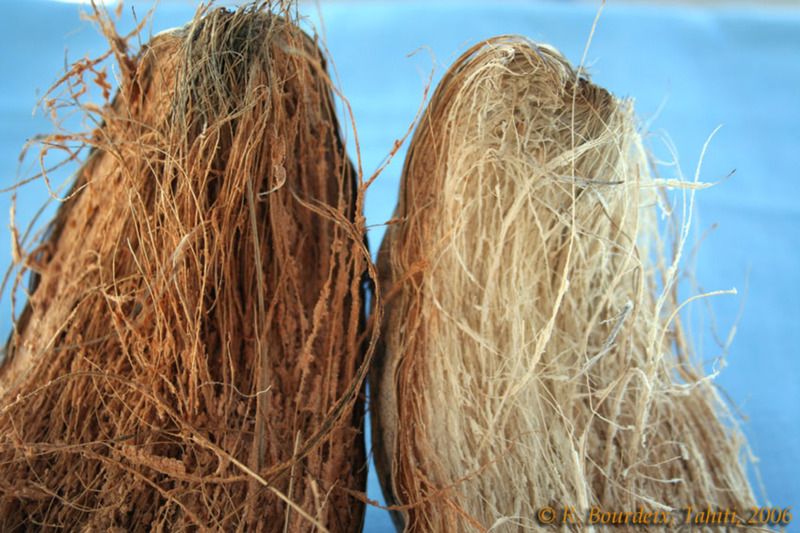 A comparison of the husk of a normal coconut (left) and a rare sweet husk coconut (right). Our survey was conducted together with a government agricultural officer. During the work, he took a tender coconut and started to chew the husk. Then he stopped, telling me, "I do not want people here to see me eating niu mangaro, because they will say I am a poor man." The consumption of traditional varieties being still perceived as socially stigmatising, not embracing a "modern" way of life. On the other hand, the consumption of imported food is considered as a mark of modernity and richness. I had one kaipoa coconut palm in my farm, but I cut it down two years ago ... Over ten years, I was unable to harvest a single fruit: all were stolen and eaten by children from the neighbourhood. So, a traditional variety remains appreciated by the next generation of Polynesians, but the farmer is not aware of the rarity and of the cultural value of the resource. Coconut lethal yellowing disease in Côte d'Ivoire: state of emergency. A video from Diversiflora International. The social and economic factors affecting coconut conservation have been the subject of discussion at two international meetings organised in 2016 by the Asia and Pacific Coconut Community in Indonesia and the Central Plantation Crop Research Institute in India. Discussions included the constraints and advantages related to coconut biology; links with conservation in institutional field gene banks; farmer's knowledge regarding the reproductive biology of their crop; socioeconomic dynamics; and policy measures. Nursery of coconut seedlings from the Green Dwarf variety for production of coconut water in Brazil. The International Coconut Genetic Resources Network (COGENT) now comprises 41 coconut-producing countries, representing more than 98% of global production. Its activities are focused on conservation and breeding of coconut varieties. Coconut germplasm is represented by about 400 varieties and 1,600 accessions in 24 genebanks. Accessions are the basic units of genebanks. In the case of the coconut palm, each accession is generally constituted of 45 to 150 palms, all collected at the same location. They are documented in a Coconut Genetic Resources Database and a global catalogue. COGENT also works on sequencing the coconut genome, in the framework of a collaboration between research organisations in Côte d'Ivoire, France and China. 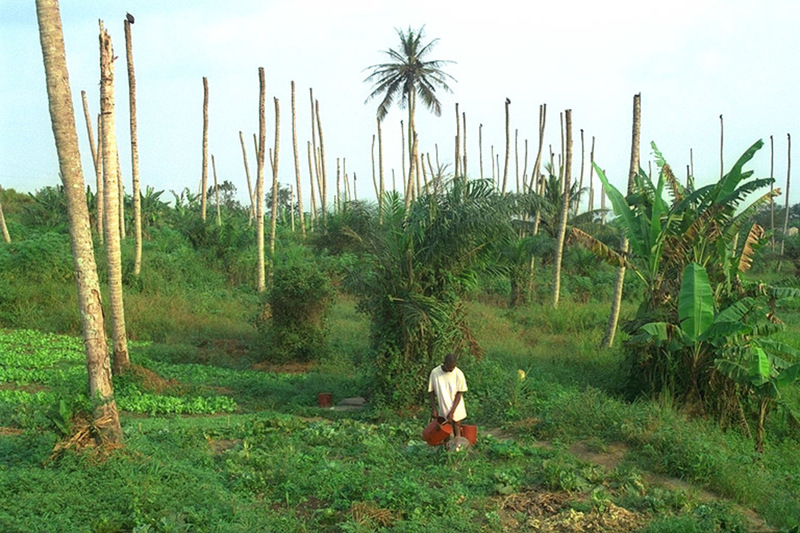 Cultivating legumes in a coconut plantation devastated by the Lethal Yellowing Disease in Ghana. Despite the upturn in the global market, many coconut farmers remain insufficiently organised, and investment in coconut research is incredibly scarce. A yearly investment of about US$3 to US$5 million in public international research would be enough to address most of the challenges of coconut agriculture. But private companies benefiting from the market boom are still scarcely involved in research funding. 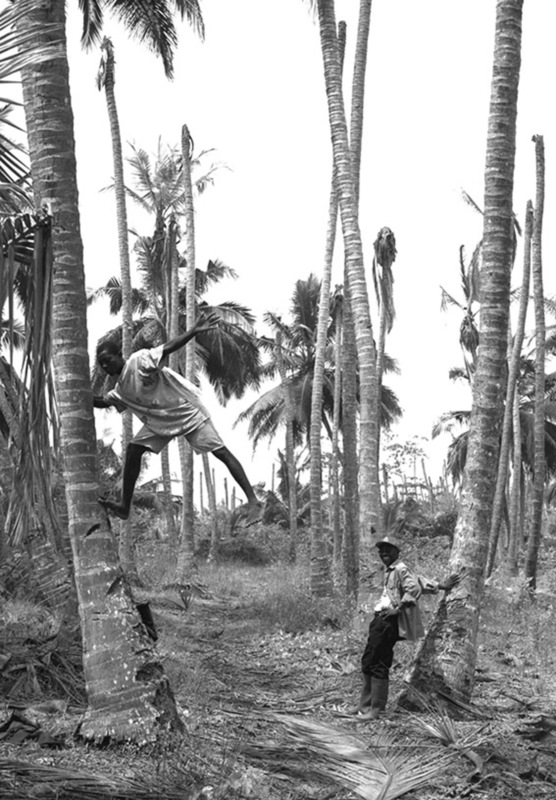 Coconut harvesters dance between trunks in Ghana. The coconut is a perennial crop, producing fruit year-round, but it takes a long time to grow. Investors, more interested in rapid profits, remain reluctant to fund the ten-year research programmes that are often needed to efficiently address the challenges of coconut research. In coconut-producing countries, under-resourced genebanks and laboratories lack the necessary budget, labour, equipment and technical training to conduct the controlled hand-pollinations required for regenerating the germplasm, and to implement other activities such as collecting, characterisation and breeding. 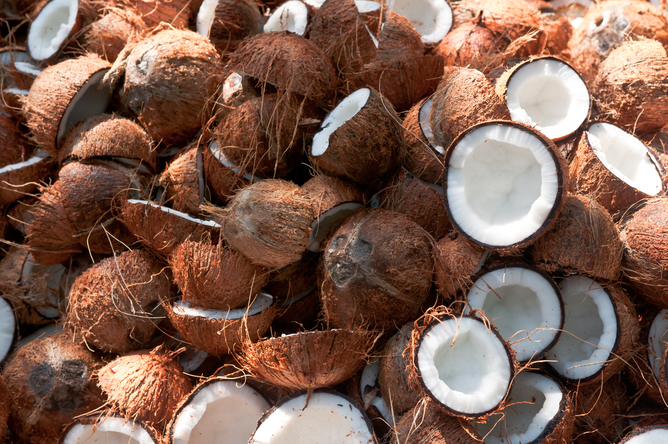 Coconut water brands will only make billions as long as coconuts are plentiful and diverse. More importantly, people all over the world rely on the security of this vital crop. Securing its future must be a priority for everyone who farms, eats and profits from the coconut.